Britain's history really starts with the industrial revolution. We'd rather forget about its Christian heritage before we stepped in. Don't worry, we'll deal with that. The architects of this revolution were heroes in top hats. These were rich men. Prior to this Britain was built upon family life in a rural 'green and pleasant land'. We turned people into economic cogs in a massive industrial machine. We gave the World the Beatles, the Stones, David Bowie, the NHS, the doctrine of multiculturalism and unbridled war. We destroyed your idyll, ripped up the family and atomised the entire society. You now know this as 'progress'. But we gave you the internet and now you have a lot of fun, internet and can share images with your friends on your mobile phones. The past, the present and the future belong to us. Looks like London is a no-go area for something like 6 weeks. For an event billed as something that will bring money, business and investment to the capital, I wonder how that will work out for those who are not gigantic global corporations. Economically, socially and in other areas (like the roads and areas of London which have been closed down), I'm beginning to wonder if the fallout from these Olympics could be quite considerable indeed. 1 April 2009: Ian Tomlinson is caught up in a G20 protest. He collapses in the street and dies. 4 April: Police say post-mortem examination show he died of "natural causes". 19 July 2012: PC Harwood found not guilty Timeline: Ian Tomlinson's death'. Fr Paul Kramer is worth listening to, no matter what people say about him and the messengers of Our Lady of Fatima. I think he is right that we are not far from WW3 and it looks like either China agree with him near totally or the State TV station enacts its various fantasies about global destruction out in their sports commercials. Chill out, China! It was only a football tournament and you weren't even taking part! Some people find Fr Paul a bit scary but I'd take him over the guy below...Love the bit where the psycho Mason says, 'Well, that was quite an overview!' Yes, it was, thanks for that! If the video below is a fake, then its an impressive fake. He's got those really frightening eyes down to a tee. Recently the IOC released this animation to promote the Olympics. 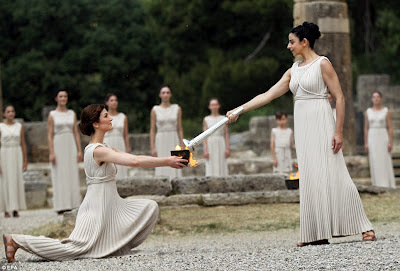 Anyone would think the IOC have obtained the Third Secret of Fatima. I find it disturbing for its symbolism on many levels. 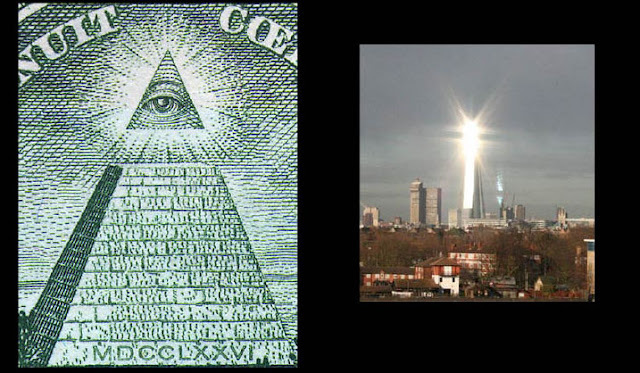 The animation opens withe the masonic 'one eye' symbolism gracing the dollar bill, various corporations and institutions and now the Olympics imagery and its irritating one-eyed mascots. Firstly, whatever you think of Parliament, Big Ben is for us a symbol of national sovereignty and heritage, the rule of law and democracy. The five rings of the Olympics, representing the continents of the World are here represented as giants of the Earth - an elite described at the end of the promotion as 'The Best of Us'. Who are the 'Best of Us'? 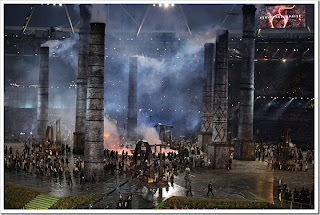 The Olympic athletes themselves or the corrupt officials organising this corrupt, supranational, pagan tour de farce? I don't know about you, but I read Dr William Oddie's piece today on the website of The Catholic Heraldwith a sense of foreboding. I really hope and I really pray that our Government are truly concerned about the protection of the nation in the 2012 Olympics, but I am beginning to have my doubts. With so much live ammunition, missiles, regiments and thousands of security forces in and around London you could be forgiven, as Dr Oddie says, for thinking that Islamic terrorists have won because national security is being ratcheted up so much that anything resembling 'normal life' is, in London, at least, being suspended. People who work in certain jobs, like civil servants in Whitehall are being told to work from home. This has alarm bells ringing in my ears because it reminds me of how various people were called and told not to go to work on the day Twin Towers fell and some were told not to fly. Hilarious post on the Olympics by Offerimus Tibi Domine. No wonder security is so high for the Olympics. Those ladies look postively dangerous and one of them is carrying a weapon. Hey, ladies! Shouldn't you be at the Los Angeles R.E Congress? Perhaps you have your own suggestions, answers in the combox. And there were we thinking that, under the Liverpool Care Pathway, we were already starving and dehydrating dementia patients without their or their families consent. Refreshingly honest for an ethicist. Why can't politicians just come right out and say it as well? Elderly people, terminally ill and those suffering with dementia are expensive to treat and nourish, so let's kill them by starving and dehydrating them to death. You don't have to believe in the message of Fatima or be wary of Agenda 21 to see that the opinions publicised in the BMJ are becoming entirely predictable. Through our speech, our word, our deeds, let us allow the power and grace of Christ to liberate us from every sin. Let us also with God's aid liberate mankind through the proclamation of truth, liberating it from all falsehood and illusions which beset us on every side, so that seeing the wickedness that emasculates politics, finance, culture and society and the snares laid in our path by the enemy of God, of humanity and of Christ's Church, Satan, that they may turn from the evil one who has deceived them, to the God who is all merciful, all loving and Who brings good even from the gravest of evils. Let us go to our local lodges and post Miraculous Medals through their doors, which open upon all who walk therein a world of magic, of illusion, but ultimately, of darkness, a darkness which, if left unreported and without criticism, will inexorably envelop the whole World. 'Alabama became the first state to adopt a tough law protecting private property and due process by prohibiting any government involvement with or participation in a controversial United Nations scheme known as Agenda 21. Activists from across the political spectrum celebrated the measure’s approval as a significant victory against the UN “sustainability” plot, expressing hope that similar sovereignty-preserving measures would be adopted in other states as the nationwide battle heats up. Above is a video of a duo singing Vespers of the Blessed Virgin Mary and singing it properly and well. A friend of mine who attends St Mary Magdalen's came over to mine yesterday after the pub where we regularly go for lunch. The last time he came over we bought a load of beer and got smashed. We both like beer, we both like fags and we both like secular music. So usually we end up smoking loads of fags, drinking loads of beer and listening to loads of music on YouTube. What's With All This Timebomb Talk? With G4S giving brewery hirers a lesson in how not to organise a celebratory function, you could be forgiven for thinking that maybe if terrorists are lurking around London plotting something even more ominous than the building designed in a bid to stab God's foot, that this year they may just win gold. But its not just the threat of a terrorist atrocity that we have to deal with in Cameron's Britain. No, there is something just as explosive and as dangerous as bombs hidden inside people's pants. That's right. Old people. 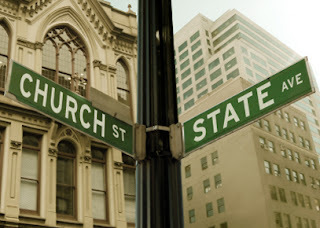 When you hear people saying that all religion is evil because it causes war, emnity, disagreement and strife perhaps what they really mean is that there will be no 'peace' until everyone worships either satan, the State or a combination of the two. London's Latest Monument to Freemasonry? I saw it today. It's really rather imposing. Why not put the Ministry of Love in the top office? It suddenly dawned on me that G4S are the same company that used to be riddled by tales of incompetency in the field of security - Group 4. Group 4 basically merged with Securicor. You can see the history of G4S here. By the way, G4S also won 'welfare to work' contracts from Government to get people signed off as 'fit for work' by Atos Healthcare off DLA and Incapacity Benefit and into 'work programmes'. Concern has been expressed that Atos Healthcare are signing people who aren't fit for work - like people suffering from schizophrenia and other health issues - as ready and able. I've been out busking a couple of times this week. First, I went out to see George and Diane by the taxi stand on the London Road. I went out really to see if I could talk with some of the men and women who live in homeless accommodation in Brighton. A local reporter wants me to put him in touch with some people who live in homeless accommodation because a certain local newspaper would like to run an investigation into the homeless system in Brighton. Unfortuntately, when I managed to get a man called Peter to talk on the phone the local reporter was away from his desk, but he did have a lot of interesting things to say.